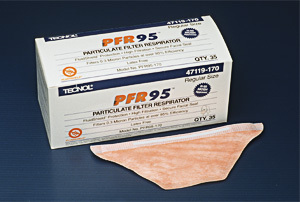 This respirator meets the newest NIOSH N95 standards for filtration. It's latex-free and offers protection that minimizes contamination caused by exposure to blood and body fluids and airborne micro-organisms. Comfortable, yet has a tight facial seal for maximum protection. Packed 35 per box. Qualitative Fit Test Kit allows to test for proper fit for all users.